In this episode of the Meet The Blogger Series we meet Susan S., another blogger whom I met and became friends with in Chicago while attending BlogHouse. 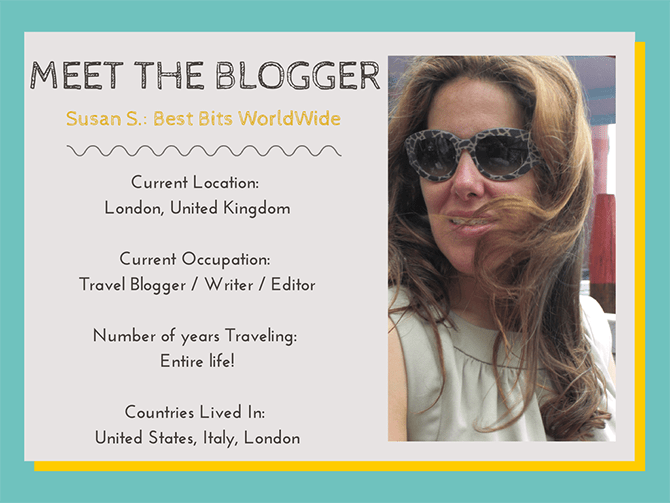 Susan is the author of the travel blog “Best Bits Worldwide“. Each week, she shares tips on some of the best things around the world. If it had to do with travel, I was the one who was being asked where, when, how by my friends and coworkers, and their friends and coworkers, thus Best Bits Worldwide was born. I used the blog format to create scrapbooks of my travels specifically targeted so that others could, not only enjoy reading them, but also download useful information. Everyone seemed to like what I shared and equally I loved sharing what I thought of as the unmissable bits wherever I traveled. I am also starting to write reviews of the luxury hotels I stay in – called A Bit of Paradise. Here is my first one about The Layana Hotel, Koh Lanta, Thailand. Just keep on writing! It is also so important to have a community of bloggers to support you. I was lucky enough to be chosen to attend BlogHouse Chicago this year. I finally met other like-minded travel bloggers and their support has been unparalleled. I was bitten by the travel bug when I saw Venice, Italy for the first time. It was a cloudy, hazy March day and the city appeared like magic before my eyes the closer we got to it. I have loved travelling ever since. I have a list of the major places I want to see and I just keep checking them. I am lucky to live in Europe so short weekend trips to different countries are super easy. I think I did not expect the Myanmar people to be so knowledgeable about the outside world. We were told we could not use our mobile phones there so I assumed that no one had them. I was so wrong. Everyone was on a phone! I felt really stupid to not know that. I gobble up travel journals of women of the 19th and early 20th centuries for they were the most daring: Lady Jane Digby, Freya Stark, and Beryl Smeeton. I am heading to Barcelona for the first time this month, Venice for the Architectural Biennale, Athens for TBEX and Marrakech again for New Years. In between, I will be discovering more of the UK. Where Else Can You Find Susan? My first major article was published in the Mail on Sunday – the most widely read travel section in the UK – on July 20! I have had works published in Vanity Fair Italia, You Magazine and on TabletHotels.com and TabletHotels.co.uk. I also write the blog Worst Bits Worldwide – where I occasionally rant about the worst bits I find along my travels.